This is an artificial lake on Castaic Creek that is backed up by the Castaic Dam to create this lake. This lake is the lower reservoir in a pumped-storage hydroelectric system. At night when electrical use is at its minimum, water is pumped up to Pyramid Lake which rests much higher than Castaic Lake. During the daytime, water is released back down through the generators to generate additional electricity into the power grid at peak usage times. 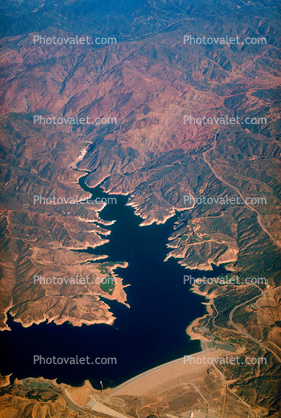 Castaic Lake is in the next canyon over from the San Francisquito Canyon in which the St. Francis Dam was located. That dam collapsed in 1928, and killed over 400 from the ensuing flood into the Santa Clara River Valley bellow. St. Francis Dam collapsed in 1928, and the resulting flood killed over 400 people in the Santa Clara River Valley. This lake was also used as one of the main locations for the action scenes for the Mighty Morphin Power Rangers.